Hi everyone! It’s Wednesday again, which means it’s time for another Mo Manning creation from me. I was talking to the DT coordinator over at Copic Marker Norge last week, and after establishing the fact that I’ve made many simple cards recently, she told me she was hoping to see a “layers upon layers upon layers upon layers Elin card” soon. I accepted her challenge and this is the result, layers upon layers upon layers, using Gathering Kindling as the focal point. I printed my image with a very low opacity percentage and colored her with Copics. She’s diecut with a Spellbinders die, and the shape of the card itself is made using a Go Kreate die. I’m a huge fan of blue for Christmas cards, so the new papers from Papirdesign are perfect for me. I’ve hidden a tag behind my image, diecut with an old Magnolia die. The sentiment is from Norsk Stempelblad AS, as are the rest of the sentiments on the card, all stamped using Papertrey Ink Enchanted Evening ink. I’ve embellished with frosted berries from Kort & Godt, a SnipArt snowflake chipboard border, some cheesecloth and diecut branches with some gesso painted as snow. I made the insides really simple. 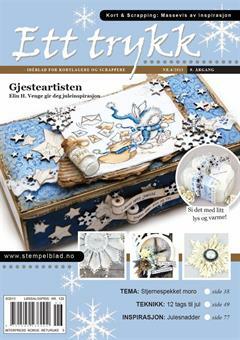 A stitched snowflake circle frame from Memory Box and another SnipArt snowflake, in addition to the sentiment. The other inside is pretty similar, but without a stamped sentiment – perfect for writing a personal message to the recipient. The back is also pretty simple. The rest of the snowflakes from that long border strip on the front, another stitched snowflake circle frame and one last sentiment. As usual, I leave you with the colors I’ve used for my image. I’ve also used B90, which is a color I’ve made myself, for the background, in addition to BV20, N0 and the blender.